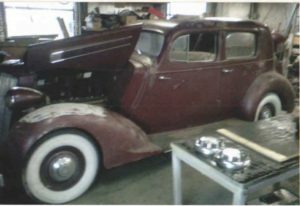 Terry Buckles, Elizabethton, Tennessee, is building this 1935 120 series club sedan. The big Packard has four suicide doors and was originally equipped with a straight eight engine. 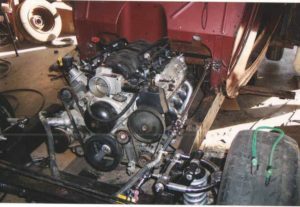 Terry removed the body from the frame, removed the X-member and modified the frame to accomodate a Chevrolet Corvette LS engine and transmission. He also installed a new sub-frame from Fat Man Fabrication. After sand blasting and painting the frame, the Corvette engine, transmission, S-10 rear and front suspension were all bolted in place. Inside the Packard Terry modified the dash and installed a Vintage Air heat/air and defrost system, power windows, new glass, tilt steering column with shifter. Seats from a Chevy truck will be upholstered in tan leather. 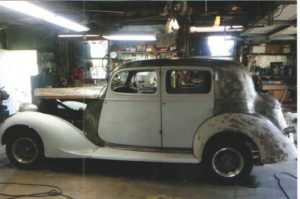 Now that Terry has the fenders and bumpers back on the car and it is driveable, it is time to break it all down, paint everything, reassemble the car, install a set of chrome wire spoke wheels and hit the road.